Just in time for hunt-season fortitude and Thanksgiving feasts, we raid meat markets and butcher shops in search of Northern Michigan’s best sausages. Synthesizing the sweet smell of slow-burning maple and the garlicky essence of Polish kielbasa, the hooded smokestack behind Bunting’s Cedar Market huffs an early winter call to action. Patrons queue up at the meat counter and pack the narrow doorway for the store’s weekly “fresh from the smoker” sale. They watch butcher and meat department manager Brandon Stachnik and his crew fill the cases with tawny coils of smoked sausage, brined pork loin, picnic hams and racks of jerky, all still warm from their stint in the 60-year-old wood-fired smokehouse. First opened in 1956, Bunting’s has the trappings of any small town grocer, with vintage linoleum floors, and shiny reach-in coolers stocked with craft beer, but the meat department is the store’s power center. 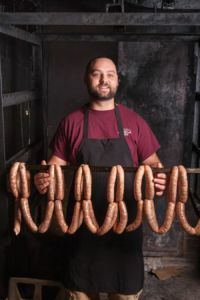 Producing more than 30 varieties of fresh and smoked sausage, Bunting’s meat mavens also have a heavy-duty rail system to break down whole hogs, cattle and wild game for their thriving custom butchery program. Brandon Stachnik took up the butcher’s blade shortly after finishing high school when he began apprenticing in the Bunting’s meat department. Eleven years later, this proud Polish-American Cedar native runs the meat department. He took us behind the scenes to see how the sausage is made. The basic building blocks of good sausage. Go. The first key rule is to be in step with the health inspector. Fresh and cured sausages need to be handled right at every step of the process, so cleanliness is our first priority. After that, it’s all about balancing flavors so that the cure, salt, spices and smoke are all working together. Is there a particular cut that lends itself best to sausage making? We use pork shoulders in almost all of our sausage, as it has a good ratio of meat to fat that keeps the sausage moist. What makes kielbasa king of the Bunting’s sausages? Kielbasa uses a hog casing, which is typically bigger, tougher and better for the traditionally coarse-ground pork. There’s a little bit of sweetness and a lot of fresh garlic in Polish sausage, but I think the secret to ours is really the smokehouse. Our smokehouse uses only local maple wood and has been in operation since the 1950s, so it imparts a uniquely deep-smoke flavor to the sausage. What’s the best way to cook a Bunting’s sausage? For smoked sausages, which have been cured and are fully cooked, I like to split them lengthwise and sear them in a hot pan or dice them up for breakfast hash. Fresh, uncured sausages, I think, are best grilled, but you can also poach them in beer or water first and then brown them. A traditional Polish dinner would include sausage, sauerkraut and often some pierogies with sour cream. Hit up the meat counters at these local butcher shops for a delectable array of sausage love. A multitude of fresh brats abound at Honor’s independent grocer. Hit up the cherry chorizo bratwurst and big-gauge Belgian sausage. Smoky, intensely garlicky kielbasa or fresh Italian links? Choose both. Over 50 iterations get stuffed by Maxbauer’s certified master sausage maker. Try the Holiday Klabassa. Thick-as-your-arm Dutch-style Mettwurst and nutmeg-laced German brats make for carnivore contentment.